As I wrote last week, I’m bringing back the BikeDC Speaks series to highlight some of the questions and issues it raised. This time, I’m also asking you to share your ideas and suggestions. What could the District do to make it an even better city for cyclists? Compared to many other places in the United States, I think D.C. has decent cycling infrastructure. However, it’s far from perfect. Below are the thoughts of eight BikeDC commuters and utility cyclists. What would you add? How can the District become an even better place for cyclists? Or, if you do not live in the D.C.-area, what are the issues your community is facing and how could they be addressed? Traffic enforcement. I get that crime is a problem, but if the city spent more time taming the 3,000-pound beasts, it would do a lot to make the place safer for everyone (and bring in lots of revenue). Maybe then neighborhoods would become the walkable and bikeable spaces we’d all like, rather than vehicle thoroughfares. I know there’s political controversy about this, but I’d love to see infrastructure throughout the entire city. If there was a way to effectively educate motor vehicle drivers how to share the road with bicyclists, that would be great. And I think all bicyclists should take a class in street cycling. More driver education about awareness of bicycles, bicycle rights, how to interact with bikes. That applies to all jurisdictions in the metro area. I guess it really applies all over the country. That kind of education should begin in the drivers’ training classes. Widen some of the bike paths. Rock Creek Park bike path is much too narrow in so many places. Practically, it’s only useful for a leisurely weekend bike ride. Continue to install bike lanes, especially a cross-town route. I usually take Pennsylvania Avenue to get across town and that works well, but bike lanes on M Street would be a big improvement. I wish the commuter trains (VRE and MARC) took bikes, and I wish those trains ran on weekends. That would really extend my abilities to bicycle out in the boonies without having to use a car to get there. I miss the bike trains that New York Cycle Club used to run using Metro North. Amtrak should have roll-on access for bikes, especially on their one train that runs out to Pittsburgh, for people who want to ride the Great Allegheny Passage (GAP) and C&O Canal Towpath. Many of the things that DDOT is already working on will continue to improve the landscape: more dedicated lanes and separated lanes with better signage. My longtime personal gripe to DDOT is about the lack of a “No Outlet” sign on Water Street heading towards the Capital Crescent Trail in Georgetown! Stop trying to force cyclists to be cars. Seriously, stop it. This “cyclists share the same rights and responsibilities as motor vehicles” is ridiculous. My bicycle is not a car. Cars are not bicycles. To lump them together and hold them to the same standard is unfair and ineffective. Cyclists need their own sets of public safety laws and expectations-and not just as an after-thought to the D.C. Municipal Regulations for motor vehicles. Revamp the existing codes and give cyclists their own road rules. 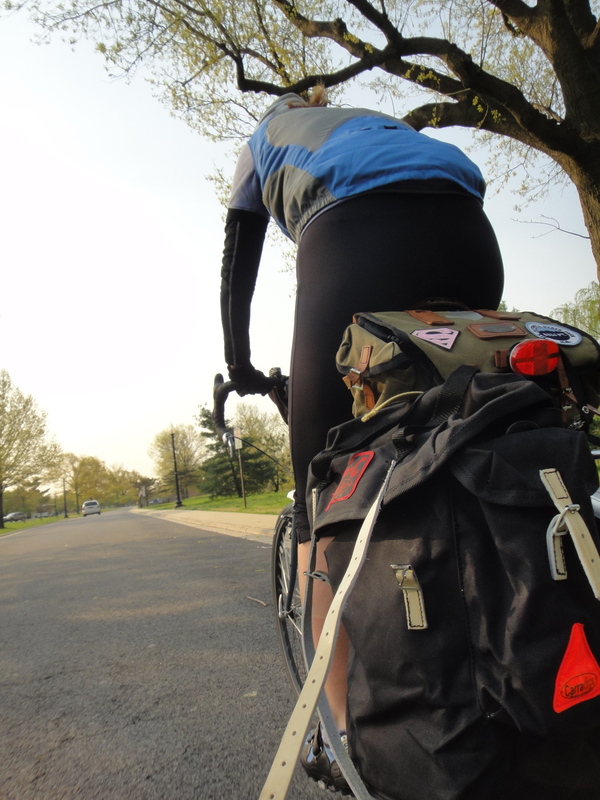 As always, thanks to the BikeDC peeps who brought this series to life and to all of you for reading. There are some very simple things that can be done to improve cycling on the many trails in the DC are. The most important is to design the bridges on the trails to withstand the weight of a snowplow, then plow the trails! When it snows around here (admittedly not a recent concern) trail commuters have to abandon their bikes for weeks. But they just go on and on, and it seems you can’t get off. Not on topic, but I wanted to share with you that I’ve set up a cue sheet holder based on your post (used an innner tube though). Easy to do, doesn’t detract too much from my beautiful bike (Sam Hillborne), and I attached a zip tie through the hole of the clasp which serves to hold the tube from my bladder which runs from the tangle bag. Purrrrfect! You lost me at bladder. The container that holds water, for example, in a Camelbak.